A friend is visiting from south Florida. He is a fellow kayaker. That means there is a default weekend agenda. Pick new water to paddle. I pull out my notes, files, maps and books. I'm stunned. As best I can tell, I've paddled every navigable creek or river in the Gainesville region, with the exception of two: Pithlacotchee near New Port Ritchey and Salt Springs near Ocala. After all, north central Florida contains a seemingly limitless number of surface waters in every direction. Creeks. Lakes. Rivers. Springs. Wetlands. Oceans. Indeed, one is almost led to believe that there is more water than dry land in the Sunshine State. Sure enough, after checking and re-checking my paddle information, it appears to be true that I've exhausted the paddling opportunities in the area. We only have time for a day paddle, so we opt for Salt Springs - a fairly short drive from Gainesville. And what a drive it is. The four-mile Salt Springs run flows to the eastern edge of Marion County, where it empties into Lake George. Marion County is nationally known for horses, and the county is teeming with an enormous number of gorgeous horsefarms that are found down countless rural roads. I had previously thought that I had been down nearly all of the horsefarm roads in the county in my years of driving and bicycling the county roads. But our drive this day to the spring takes us down Rt 316 between US 441 and Rt 19. And it is a stupendous, memorable treat. Large, stately, graceful live oak trees form an enclosed, delightful tree canopy for much of this stretch. Along Rt 316, one finds an astonishing number of well-groomed, luxurious, supremely picturesque horsefarms. I vow to return to this road soon to show it off to my horsefarm-loving wife. 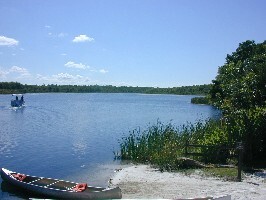 We arrive at the Salt Springs Recreation Area and learn that it is $4 per person, and boat-launching is only allowed for those camping at the Recreation Area. After being refunded our money, we are pointed to a marina a few hundred yards to the south. We pay a $4 fee, launch our boats from a small beach, and dip paddles into the clear, cool waters of Salt Springs. Our first objective is to investigate the spring head pool a short distance upstream from the marina. There, on a very hot summer Saturday, is a large flotilla of motorboats anchored in a crescent shaped array where the spring issues into the channel run. There, the boat passengers lounge on their boats and in the water. A stereotypical beach scene of adults, young children, country music and sunscreen. Salt Spring is a 2nd magnitude spring. A concrete wall, first built in 1946, rings three sides of the spring pool. The pool measures 110 fee in diameter. Mostly, the pool depth is 2-5 feet, but is up to 20 feet deep at the several spring vents that are scattered in the pool. The combined flow from these vents is around 52,000,000 gallons per day. A strong, cool, crystal clear current of this spring water issues into the spring run along a 3-4 foot deep, sandy-bottomed channel. The springs are known as "salt" springs because the water rising to the surface passes through ancient salt deposits embedded within the limestone substrate. We pass up the opportunity to swim the spring, as a fee is required to use it. The most obvious first impression of Salt Springs for the paddler is that the run is extremely wide. Interstate highway wide. Upstream though, the water is exceptionally and redeemingly clear, which gave us a clear view of the very abundant population of fish, which, in this river, can include largemouth bass, striped bass, sunshine bass, catfish, crappie, shellcracker and bluegill. In particular, we see a great many flying mullet. Much of the water surface along the river has thick blades of sea grass floating at the surface, undoubtedly because of the motorboat propellers cruising up and down the shallow waters of the river during the day. As you would expect from the healthy population of fish in the river, we see quite a large number of birds of prey - particularly osprey - and a great many great blue herons and snowy egrets. At one point, we spot a rather large blue crab which has latched on to a large fish with his claws. (the river contains a blue crab population because a shallow sea once covered the area in ancient times, and when the sea receded, the crabs remained. We discover that the river has very little shading from trees along the way, in part because of the large channel width and in part because large trees are back behind large expanses of marshy vegetation which hug the river banks. Nevertheless, despite this lack of creek intimacy, we see little if any evidence of development along the way, with the exception of a small wooden boardwalk overlook. We don't even see any cleared land for agriculture or tree farms. The region this river passes through is certainly remote. An important problem for paddlers on the Salt Springs run is the large volumes of often loud motorboats and air boats that ply the river. Often, the boats (and their fumes) stay with the paddler for quite some time, as more than once, motor boats are obligated to slow to idle speed, which essentially slows them to paddling speed. Like nearby Alexander Springs, Salt Springs shares the unusual characteristic of having its channel width neck down to a more modest width downstream (ordinarily, a river grows increasingly wide the further one moves downstream). Even with this narrowing, however, Salt Springs never gets down to that intimate width I've come to enjoy in a kayak on many, many other creeks in north central Florida. The end of the run opens up into Lake George. There, we see folks using nets to catch blue crab. We also see the head of an otter swimming near the shoreline. There are no take-out points for the paddler on Salt Springs run, which requires the paddler to either paddle to a boat ramp on Lake George, or double back upstream to paddle back to the Salt Springs put in. Which is what we end up doing. Once back, we find that the crescent of boats at the spring head has now grown to a size that suggests a Kenny Rodgers concert is taking place on a platform above the pool. A pleasant feature at the marina, which I have not seen in the past, is a PVC pipe, which gushes the cool, refreshing, clear spring water from an artesian well. We use the water to wash off our sun-parched faces. Apparently, the Salt River had a glorious past, a past that has been sullied over the intervening centuries of human settlement, motorboats, and general overuse of the river. Here is how the river once was, according to William Bartram, the famous 18th century naturalist, during his explorations in Florida visited Salt Springs in 1773. His observations of the spring are found in Travels, published in 1791. ". . . in front, just under my feet, was the enchanting and amazing crystal fountain, which incessantly threw up, from dark, rocky caverns below, tons of water every minute, forming a basin, capacious enough for large shallops to ride in, and a creek of four or five feet of water, and near twenty yards, over, which meanders six miles into the great Lake George, where they seem to remain pure and unmixed. About twenty yards from the upper edge of the basin, is a continual and amazing ebullition, where the waters are thrown up in such abundance and amazing force, as to jet and swell up two or three feet above the common surface: white sand and small particles of shells are thrown up with the waters, near to the top, when they diverge from the center, subside with the expanding flood, and gently sink again, forming a large rim or funnel round about the aperture or mouth of the fountain, which is a vast perforation through a bed of rocks, the ragged points of which are projected out on every side. . . But there are yet remaining scenes inexpressibly admirable and pleasing. Behold, for instance, a vast circular expanse before you, the waters of which are so extremely clear as to be absolutely diaphanous or transparent as the ether; the margin of the basin ornamented with a great variety of fruitful and floriferous trees, shrubs, and plants, the pendant orange dancing on the surface of the pellucid waters, the balmy air vibrating with the melody of the merry birds, tenants of the encircling aromatic grove. But behold yet something far more admirable, see whole armies descending into an abyss, into the mouth of the bubbling fountain: they disappear! Are they gone for ever? I raise my eyes with terror and astonishment; I look down again to the fountain with anxiety, when behold them as it were emerging from the blue ether of another world, apparently at a vast distance; at their first appearance, no bigger than flies or minnows; now gradually enlarging, their brilliant colors begin to paint the fluid.